Tel: +420 775 135 503. 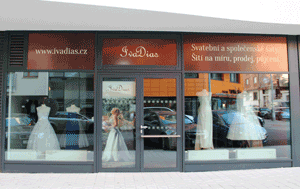 E-mail: ivadias@seznam.cz Opening hours: Mon--Sat from 9:00 am to 7:00 pm only on arrangement! You need to order dresses; you need to write or call us in advance. We will focus our attention on you alone. IVADIAS. September 22nd, 2016 COPYRIGHT 2015. KOPÍROVÁNÍ JE DOVOLENO POUZE S ODKAZEM NA ZDROJ.